The image at the top of the post is of Shiro Amada, the main protagonist of “Mobile Suit Gundam: 08th MS Team”. Before the “proper” show starts, Shiro Amada was an Earth Federation soldier serving on a space colony that saw its entire civilian population wiped out by poison gas during the Republic of Zeon’s first strikes against the Federation. Shiro was saved because of his military issue spacesuit, but was helpless to save anyone else. While this was not shown in the anime itself, it was represented in an animated cut-scene in a Gundam video game I once played and enjoyed. 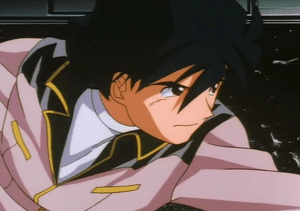 During the first episode, Shiro sorties in a crude prototype of a zero-G construction vehicle that has been weaponized for combat, a “Ball” (that looked like one, except with two cannons stuck on the top) that was considered unable to fight any mobile suit (the big humanoid, man-piloted robots) in one on one combat. He sortied from a transport shuttle, risking his own life, to save a survivor of a Federation mobile suit squad with a damaged machine. In making his sortie, he said to him self, “Side 2 no ni no mai wa gomen da!” In other words, he wouldn’t allow a repeat of Side 2, which wasn’t really a mistake so much as a circumstance: his own helplessness while others died. This entry was posted in Japanese, Languages and tagged gomen, Japanese, language, learn, mistake, ni no mai, nihongo, repeat. Bookmark the permalink.